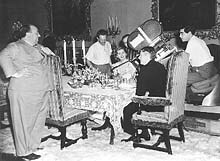 Alfred Hitchcock with Joan Fontaine and Laurence Olivier on the set of Rebecca, Best Picture Academy Award winner in 1940. Alfred Hitchcock's 100th birthday appropriately fell on Friday the 13th of August, but he continues to receive tributes through October. Universal Studios, home to the suspense-meister for much of his career, and the American Cinematheque present a week-long showcase of ten international directors in the inaugural Universal Studios Hitchcock Director Series at the Egyptian Theatre on Hollywood Boulevard. Special guests include Pat Hitchcock O'Connell (daughter of Alfred Hitchcock), Joe Dante, Curtis Hanson, Ken Loach and Arthur Hiller. The Academy of Motion Picture Arts and Sciences honors Hitchcock with "From the Hitchcock Collection," a film program led by Peter Bogdanovich. The writer/director was both a friend and interviewer of Hitchcock. Featured will be a number of rare items -- home movies, screen tests, unusual trailers and rare documentary footage -- donated to the Academy Film Archive by the Hitchcock Estate. Special guest of the evening will be Janet Leigh, who received an Oscar nomination for her performance in Psycho. Posters such as this one are among the materials in "The Hitchcock Collection," an exhibition of rare materials donated to the Academy's Margaret Herrick Library by the Hitchcock Estate. The Academy honors Hitchcock's U.S. directorial debut by screening a newly restored print of Rebecca in the Goldwyn Theatre. The print was restored by the Walt Disney Library Restoration. Also in celebration of the centennial, an exhibition of materials donated to the Academy's Margaret Herrick Library by the Hitchcock Estate runs through October 31 in the fourth floor gallery at the Academy in Beverly Hills. Viewing hours are Tuesday through Friday, 10:00 a.m. to 5:00 p.m. and weekends from noon to 6:00 p.m. The Academy is located at 8949 Wilshire Boulevard in Beverly Hills. For more information, call (310) 247-3600. The Los Angeles County Museum of Art is screening North by Northwest, The Lady Vanishes, The Thirty-Nine Steps, Suspicion, a 70mm print of Vertigo and a newly restored print of Notorious in a program which runs from August 26 through September 11. For more information, call (323) 857-6000. The Museum of Modern Art in New York is exhibiting rare Hitchcock photos, storyboards and letters during August. Also in New York, The Tisch School of the Arts hosts "Hitchcock: A Centennial Celebration," a conference examining the master's career, October 13 through 17. 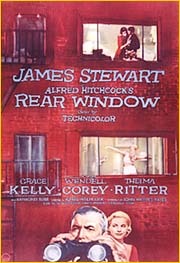 Hitchcock was not only the filmmaker who brought us such classics as Psycho and Rear Window. The British-born director is also famous for his television classics -- "Alfred Hitchcock Presents" and "The Alfred Hitchcock Hour." And so he is being honored by the television world as well. The Museum of Television & Radio in Beverly Hills presents a retrospective of his small-screen work in "Hitchcock by Hitchcock: A Centennial Salute," running through September 12. Included are 20 episodes, some of which were never televised after their original airings. The program screens Thursdays through Sundays at 2:00 p.m. and 3:45 p.m. (Additional screening at 6 p.m. on Thursdays). For more information, call (310) 786-1000. The Encore Cable Channel premieres the documentary "Dial H for Hitchcock: The Genius Behind the Showman," hosted by Kevin Spacey. It includes rare film clips and footage along with interviews with Tippi Hedron, Janet Leigh, Robert Altman and Brian DePalma. Encore will also hold a 24-hour Hitchcock marathon, including Psycho, Vertigo, Torn Curtain, Family Plot, Topaz and a couple of "The Alfred Hitchcock Hour" episodes. American Movie Classics presents two documentaries -- "The Movie Makers: Alfred Hitchcock" and "Family Portraits: Alfred Hitchcock." The cable channel will also air The Wrong Man, Stage Fright, Mr. and Mrs. Smith and Jamaica Inn. Turner Classics will air The Birds, Marnie, and Suspicion. The TV Land Channel will present a 24-hour marathon of episodes from "Alfred Hitchcock Presents" and "The Alfred Hitchcock Hour." Hitchcock's birthday is being commemorated elsewhere around the world with tributes at the Venice Film Festival, the British Film Institute and the Museum of Modern Art in Oxford.